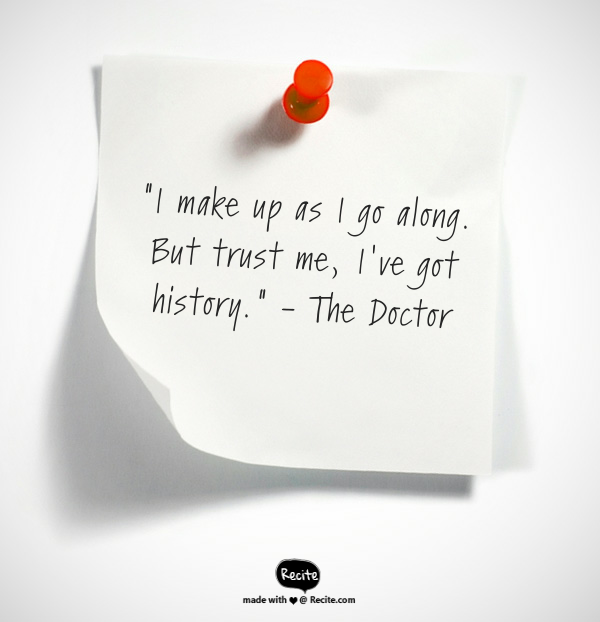 I opened up the small, wooden cabinet and peered into the shelves and tiny drawers. The wood was dusty and it smelt damp, as though it had been forgotten there for some time. Despite the age, the dust and the little chip in its right hand corner, it was clear it had once been a beloved piece of furniture in someone’s home. I move onto another cabinet, this one with its door coming off and a mean looking cobweb in the back corner. 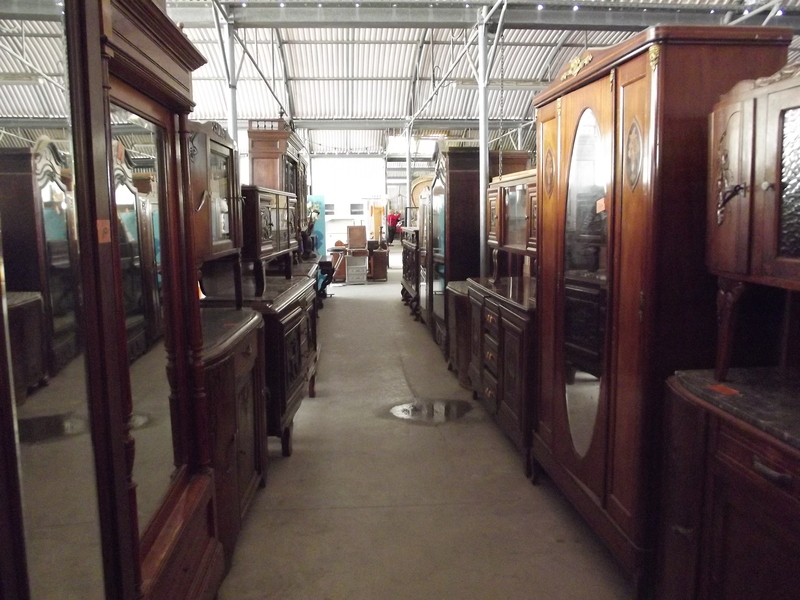 Beyond these two are about 50 other small cabinets and wardrobes of various sizes and shapes. Behind me is what looks like an airport lounge made out of sofas, armchairs, bean bags and rocking chairs. 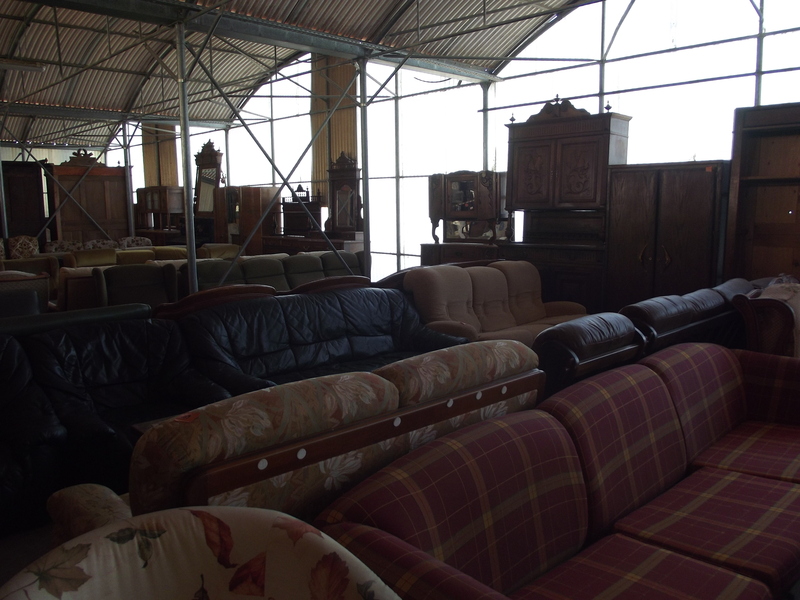 This is just one small corner in one barn in one part of the Communaute Emmaus Beziers, in Servian, with everything having been donated by the local community over the years to this fantastic cause. Emmaus is an international charitable movement which was founded in France by the priest Abbe Pierre in 1949. 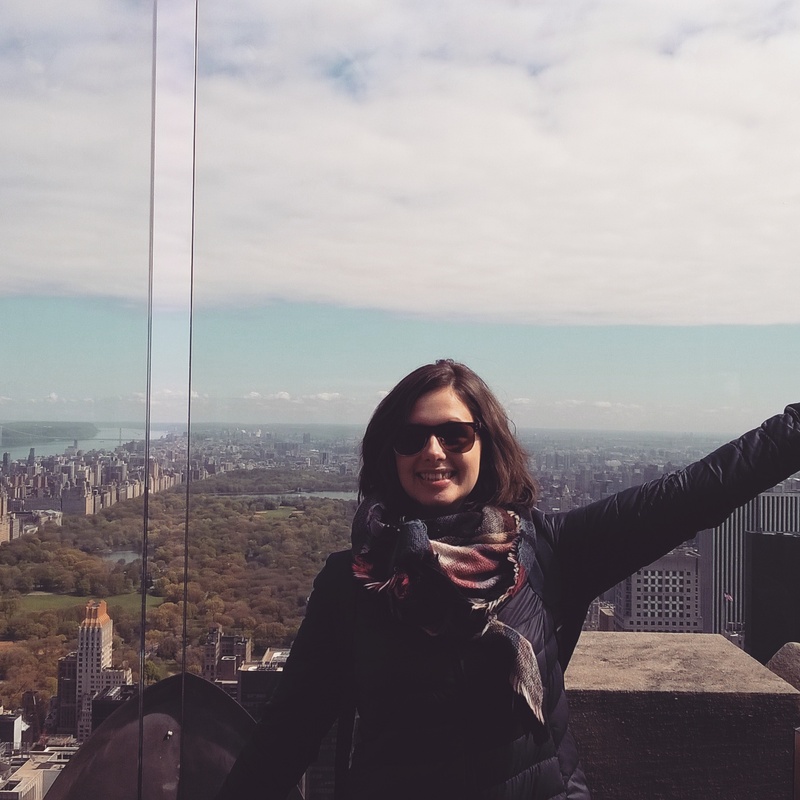 Since then it has grown and grown, becoming a huge organisation under the title ‘Emmaus International’ and stretching to all corners of the globe. Although it was born and is a household name in France, there are Emmaus groups as far away as Colombia, Lebanon, Indonesia, and Madagascar. The premise is similar to many other ‘charity shops’ with people bringing in unwanted, out of fashion, broken down bits of household items to be sold on for a cheap price to anyone who fancies them. The difference with the Emmaus is that the people who do the day to day selling, collecting sorting and delivering are vulnerable people who may otherwise be homeless and jobless. At the Emmaus in Servian, those working for the charity live in the beautiful old house overlooking the vineyards and the barns stuffed with donated goods. Their washing is strung up on lines in the back garden and they hand out water on hot days as bargain hunters slog through the bric-a-brac section in the baking sun. Visiting an Emmaus is a surreal, rewarding, slightly confusing, and interesting experience. You could find a shady spot and people-watch all day if you had the means to do so. There are people dropping off furniture that they no longer want or need, people picking up furniture they’ve purchased for a bargain price; families turning up to get toys, clothes, books, highchairs and pushchairs for children; couples looking for things to decorate their home. For some its the only place they can really afford to buy things for their home; for others its just a supplement to high street chains or Ikea. Signs are written in French, English and Arabic, reflecting the demographic of people who come in through the barn doors to snoop through serving dishes, clothes and VHS cassettes. And all the time a radio somewhere is blaring out music, and the (mostly male) staff sitting behind the desks are smiling, despite the fact the barns are as hot as ovens and it smells like a damp house that’s been locked up for years. 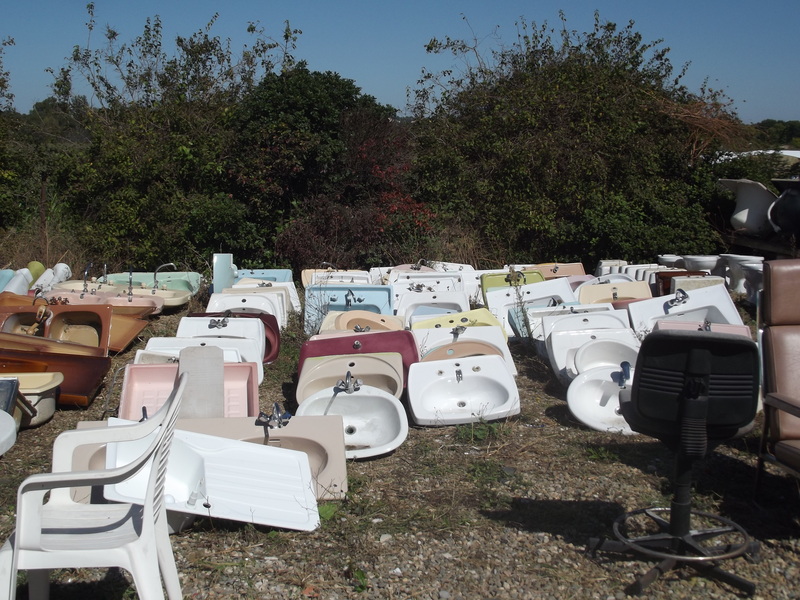 That’s a lot of sinks…. The range of things you can get at an Emmaus are staggering. 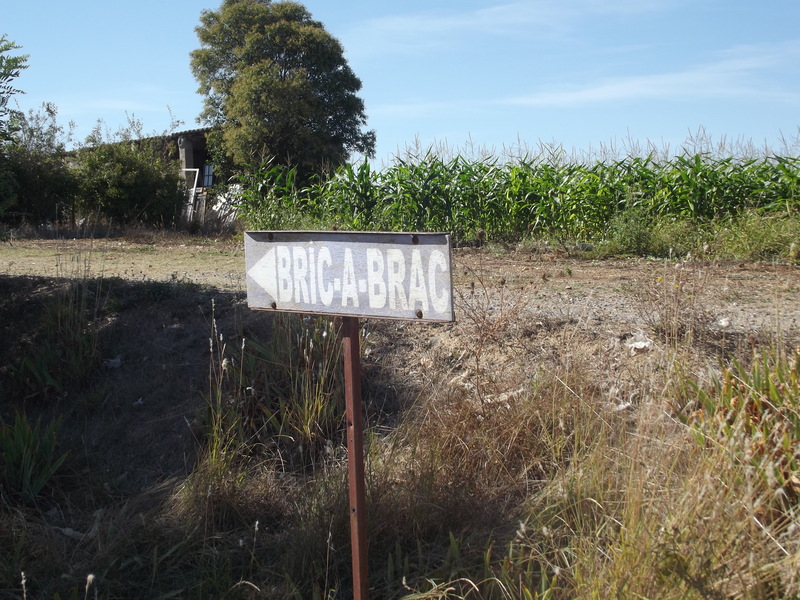 The bric-a-brac section alone blows your mind with rows and rows of toilets, sinks, baths, doors, lawn mowers, and huge metal shelves full of tea cups. 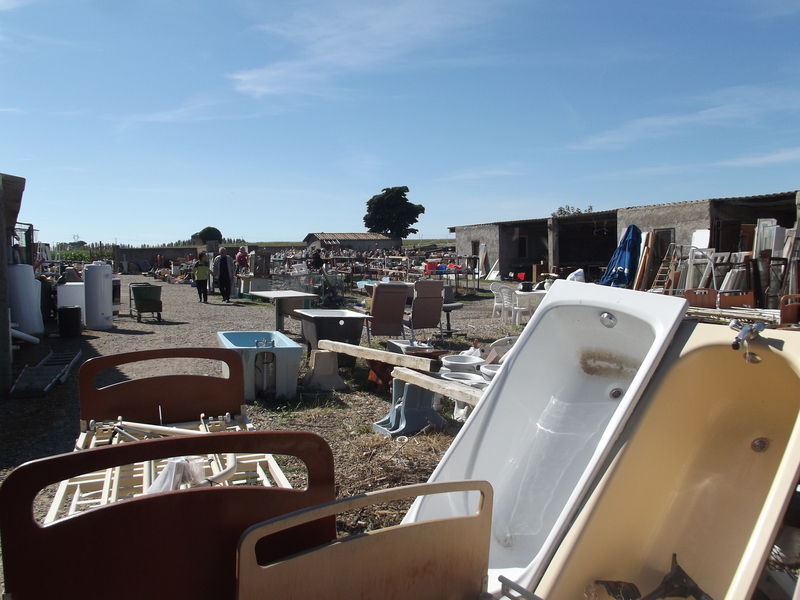 There’s a basket of rust-covered knives and stacks of plates, book ends, a pile of Jesus figures nailed to crucifixes, a shopping trolley full of biscuit tins, a trough of bath plugs. And in between it all is the usual flotsam and jetsom that people acquire in their lifetimes and simply do not know what to do with. When it’s sent to the Emmaus it’s never turned away, instead put out for people to pick through at their leisure. 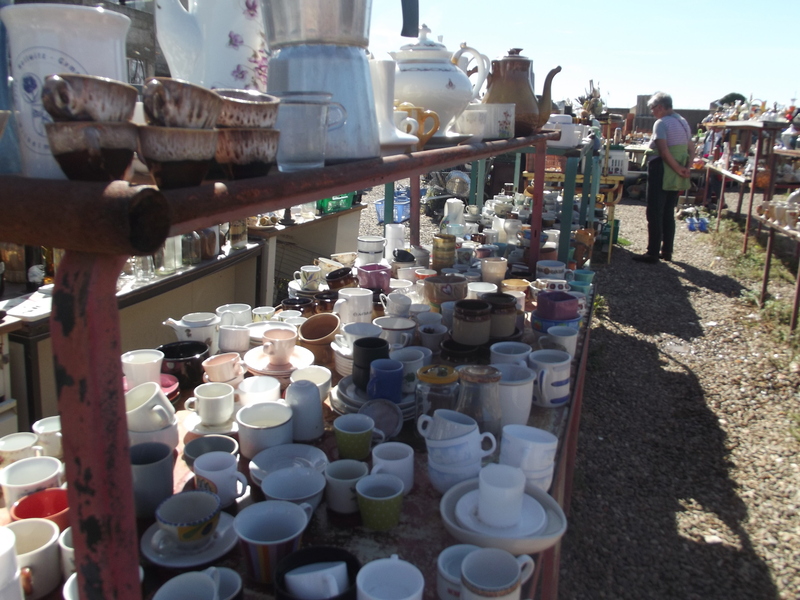 The bric-a-brac section is left to the elements so one of the Emmaus workers is often wondering around tipping out any collecting rainwater or insects. Others sit about on lawn chairs enjoying a cigarette, waiting for someone to ask them to drag a 20 year old bath tub out of the overgrown grass to their car. A man sits in a hut at the far corner and booms ‘bonjour’ at everyone who walks past. Abbé Pierre created the Emmaus movement to help the poor, homeless and refugees. 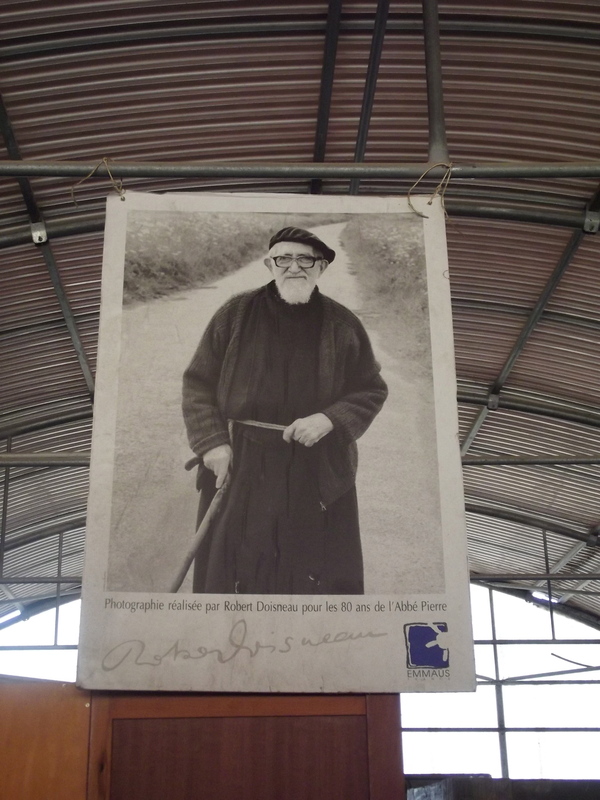 It was the 100th anniversary of his birth back in August of this year, and hanging above a long aisle of wardrobes in one of the barns is a huge black and white photograph of the man whose organisation grew from a tiny community in Neuilly-Plaisance in 1950. A man who fought in the French Resistance, helped Jewish people escape Nazi persecution in Paris, and turned his hands to politics in post-war France. During the harsh winter of 1954 he gave a powerful speech on Radio Luxembourg on the plight of homeless people freezing to death in the streets of Paris; they were overwhelmed when 500 million francs were donated overnight, including 2 million from Charlie Chaplin. He set up Emmaus groups all over the world to help people in all sorts of situations, from families left with nothing in the middle of Middle Eastern conflicts, to desperate refugees in Bangladesh. His death was mourned all over the world in 2007, his funeral held at the Notre Dame Cathedral in Paris. It might not seem much when you pull out a rusty tea spoon from a pile of chipped crockery, or peer into a bin full of food processors and toasters, but the Emmaus movement and the man behind it really is a global charitable phenomenon. If in the future you want to buy a new nick-knacks for home, or even if you need whole new pieces of furniture, remember to keep Emmaus in mind and have a search online to see where their nearest one to you is.